View of Fires consuming downtown, April 1906. 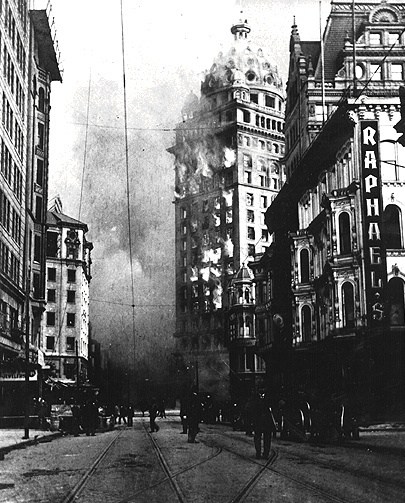 The Call building (the tall building center right) stands at 3rd and Market and was gutted by the fire. Just before dawn on the morning of April 18, 1906, San Francisco was rocked by the first of a [[April 18, 1906: EARTHQUAKE! FIRE!| |devastating series of earthquakes]. Within hours the city was in flames. By mid-morning throngs of people had descended on Market Street to see if the Call Building was still standing, or to watch its inevitable topple. What they saw was not what they had expected, but was another awesome and terrifying spectacle. The building was indeed standing, and was showing no effects of the temblor, despite the doomsday predictions of those who opposed skyscrapers. But at about 11:00 a.m., the Winchester Hotel behind the building succumbed to the flames that had swept up Third Street from the south, fueled by neighborhoods of cheek-to-jowl wooden buildings. Flames jumped from the collapsing Winchester to a small shoe store whose flammable materials went up instantly. From there the fire spread a few feet to the third floor of the Call Building, burning through one suite of offices in the southeast corner before reaching the corridor and the elevator shafts. Within two hours the city's most famous structure was a smoldering shell. In the days that followed, after so much of the city had been destroyed, the familiar silhouette of the Call Building became another kind of symbol--a symbol of hope and of the indestructible nature of San Francisco. In photograph after photograph of the ruined financial district it towers over piles of rubble and charred vacant lots. The building had taken all the earthquake offered, it had endured the ravages of the fire and survived, empty and blackened, but still standing. The architects and contractors who had built it less than ten years before had used all their skills to render it earthquake-proof and fireproof, and to a great degree they succeeded. 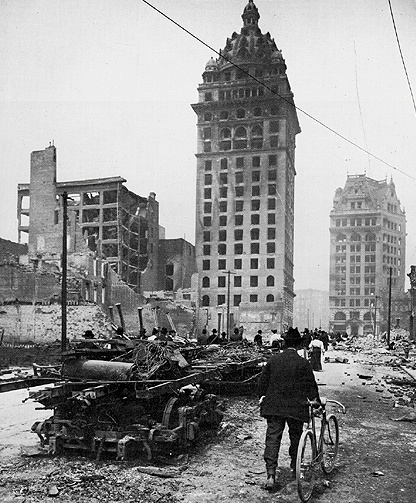 The U.S. Geological Survey of San Francisco after the earthquake and fire said it was "the best designed skeleton building in San Francisco ...the general behavior of the structure demonstrates that high buildings subject to earthquakes can be erected with safety." Most of the damage to the building had been from the fire. It showed little or no structural damage, just a few ornaments and pieces of the dome where some of the terra cotta had pulled loose in the quake. The "fire-proof" concrete and terra cotta tiling proved inefficient in a fire of that intensity; under more normal conditions, and had firefighters been able to combat the blaze at all, more might have been saved. All of the wood in the building--floors, windows, wainscoting, office furniture--had been consumed; few of the plaster and lath ceilings survived; and the marble in the lobby, corridors, and stairs had been burned to powder by the intense heat. The exterior walls were blackened, but intact. The interior was gutted. Within a month of the fire the lower floors of the building had been reopened while workers made extensive repairs to the upper stories. Scaffolding covered the building for more than a year as elevators were repaired, walls and floors rebuilt, and offices refinished. When Claus Spreckels died in 1908, the building was complete once again, and a good number of tenants had returned to their offices. But the cafe never reopened, and the San Francisco Club and the Reid Brothers moved on to other quarters. The dome was structurally restored to its old glory, but it remained empty for the next thirty years.